A quest spanning 15 years has unearthed one of the rarest parrots in South America. 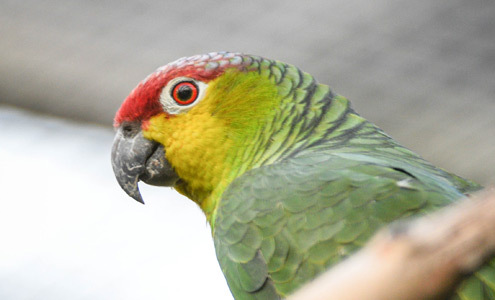 Dr Mark Pilgrim, Chester Zoo’s director general and one of the world’s leading experts on Amazon parrots, made the 11th hour discovery which could now save a species - known as the Ecuador Amazon parrot - from extinction. “The rate at which animals are becoming extinct is higher today than at any other time in history. In the face of this crisis, and a lack of adequate resources with which to properly address it, it’s not really surprising that subspecies are seen as being of lesser conservation importance to full species. “This places great significance on taxonomic evaluation studies of threatened animals, as misclassifying a species as a subspecies will mean it’s likely to be overlooked as a conservation priority. “Whilst working as a bird keeper at Chester Zoo in the late 1980s, I was fascinated by a little green parrot called the Ecuador Amazon (Latin name Amazona autumnalis lilacina). At that time we only had a pair of these parrots which came to the zoo after being confiscated by customs officials in the UK. They were part of a haul of 150 birds that had been illegally trapped and exported to Europe where they were destined to be sold illegally into the pet trade. Dr Pilgrim therefore set out to determine whether or not A. a lilacina is sufficiently different from the other three A. autumnalis subspecies to be considered as a separate species. Between 1992 and 2013, he visited museums, bird parks and zoos across Europe to try and discover more. “The first step was to look for any morphological differences – basically body shapes and colour patterns,” said Dr Pilgrim. “So I travelled to museums in different parts of Europe to analyse more than 60 specimens, taking measurements such as wing-length, tail-length and beak shape. Not only were the specimens few and far between, some were in very poor condition which only added to the challenge. I also looked at 17 live parrots, kept at Chester Zoo, and took opportunities to analyse them only when they were anaesthetised for any pressing veterinary reasons. “Next I looked at their genetics. Using labs at Liverpool John Moores University, I extracted DNA from feathers and looked at small differences in specific genes that were selected for sequencing. 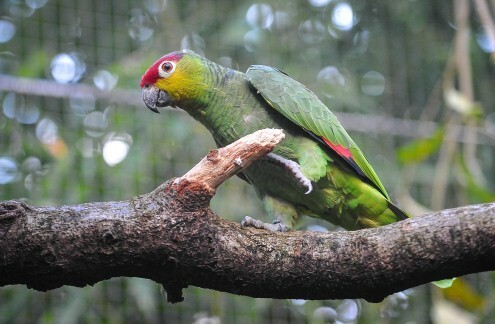 Freshly moulted, primary, secondary and tail feathers of captive Amazona parrots were used as the DNA source, as opposed to taking blood or tissue samples, to avoid causing them any stress. These feathers came from birds kept by zoos and private aviculturists from all over Europe and were collected by a strict protocol to ensure their reliability. 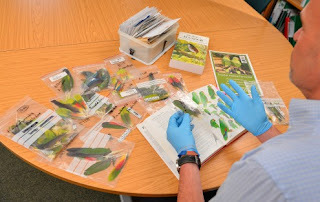 These investigations have uncovered strong evidence that the Ecuador Amazon parrot (A. a lilicina) is indeed morphologically, behaviourally and genetically distinctive, providing justification for it to be recognised as a full species. But the findings, and the parrots’ impending re-classification, have far-reaching consequences. With full species recognition, the Ecuador Amazon parrot is now likely to be considered as ‘endangered’ by the International Union for Conservation of Nature (IUCN) and Birdlife International, meaning it faces a very high risk of extinction in the near future. It has a greater than 50% chance of disappearing altogether in the next 20 years. “The Ecuador Amazon parrot was previously included within a group of subspecies of which there may be as many as five million. The main implication of this work is that they are so distinct they are now considered as a full species, of which there are only 600 left. This makes a huge difference to their conservation priority. “So having shown that it’s a species in its own right, we now need to make sure we don’t lose it. “With 80 Ecuador Amazon parrots in European zoos as part of a conservation breeding programme, now almost a fifth of the world’s population, we realise how precious they are. To add to the work Chester Zoo is now sending an expedition to carry out more vital research on the parrots in the wild. A team of 11, including experienced conservationists and bird experts, will study the birds during their nesting season in the Cerro Blanco Forest in South West Ecuador. The team is tasked with monitoring the parrots, collecting important data and setting camera traps to try and learn more about them. “Despite my 15 years of research there are still so many questions that need to be answered. We need to know what trees the parrots feed on, what else may compete for that food in the forest, where they nest and what their behaviour is whilst they nest. This basic biological information is vital to produce a conservation action plan. "Additionally we need to do an accurate head count – we want to find out as precisely as we can just how many of these wonderful birds are left so that we can judge if and how fast the population declining. This will help us to understand what we need to do to raise the level of protection of the Cerro Blanco Forest and for the parrots. “Having this basic information will help us to discover the best ways to protect and preserve their habitat.